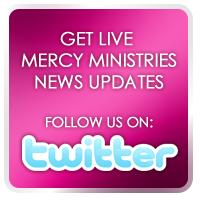 Mercy Ministries News: Another Life Made Possible by Supporters Like You! Another Life Made Possible by Supporters Like You! We love celebrating new life – the new life in Christ found by girls in our program, the new lives born to our pregnant residents, and the new lives born to our graduates, sometimes years after they’ve left Mercy. What’s amazing is how these girls want to share with us their joy and often tell us that without Mercy, their babies would not have been possible. Heather, a Mercy grad from 10 years ago, recently shared her story and some great photos!